The first time I travelled from Toronto to Vancouver I went with friends in a red Ford Cortina. In 1970 I was still a university student and since arriving from China as a five-year-old, I had never left southern Ontario except for an elementary school trip to Ottawa. During that long ago car trip I was inspired by the immensity of this country, its beauty and varied landscape. Yet there was one constant that made an impression on me then and stays with me today. Almost without fail, every small town we drove through had a local Chinese restaurant, and I knew, much like my family, the people who ran these restaurants would be separated from the community by language and culture, that their lives would be lonely, especially the older generation, and that work and home were melded into one, unchanging and monotonous. I remember thinking of my own father who came to Canada in 1914 before the First World War, and spent his life toiling away in isolated communities like Timmins, Trois Rivières and Pembroke; I thought of his endurance and deep commitment to family. What struck me the most, however, was that despite the ubiquitousness of these small Chinese businesses in towns across Canada, they, and their owners, were and still are largely invisible to the local population. And as I thought about writing this novel, it occurred to me that this seemed mirrored in Canada’s literature. When I picture Alice Munro’s Jubilee, or Margaret Laurence’s Manawaka, I can see the Chinese restaurant. I know it’s there, even though it may not be mentioned and I can picture the people who ran it. With only a few exceptions, they have been as invisible in literature as they have been in life. In my writing I hope to lift this cloak of invisibility, if only a little, to give a glimpse to the rest of Canada of the lives upstairs from the restaurant, the laundry, the fruit market, to reveal the deep and complex emotions that exist behind the calm monotony of their daily routines. And on a personal note, I hope my writing, in some small way, is a tribute not just to my parents but to all those parents who came to Canada from a faraway land and toiled in obscurity to give their children brighter futures. I want them to be remembered. 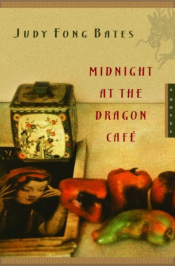 Set in the 1960s, Judy Fong Bates’s much-talked-about debut novel is the story of a young girl, the daughter of a small Ontario town’s solitary Chinese family, whose life is changed over the course of one summer when she learns the burden of secrets. 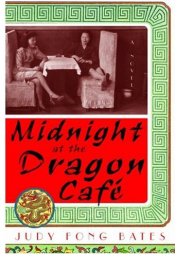 Through Su-Jen’s eyes, the hard life behind the scenes at the Dragon Café unfolds. As Su-Jen’s father works continually for a better future, her mother, a beautiful but embittered woman, settles uneasily into their new life. 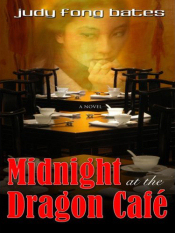 Su-Jen feels the weight of her mother’s unhappiness as Su-Jen’s life takes her outside the restaurant and far from the customs of the traditional past. When Su-Jen’s half-brother arrives, smouldering under the responsibilities he must bear as the dutiful Chinese son, he forms an alliance with Su-Jen’s mother, one that will have devastating consequences. 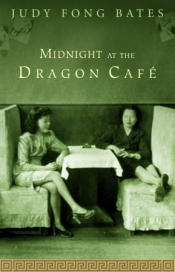 Written in spare, intimate prose, Midnight at the Dragon Café is a vivid portrait of a childhood divided by two cultures and touched by unfulfilled longings and unspoken secrets. I have kept only three possessions from my childhood. Each one is a book. The first is a coil-bound sketch pad with a cover made of heavy cardboard, a muted olive green. The pages are filled with drawings – of trees and flowers, of animals and soft nudes, but also of fantastic creatures, some beautiful, some hideous, entwined and growing out of one another, out of eyes, bellies, tongues, mouths. As a child I found the drawings magical, yet they unsettled me, pulling me into a world I did not understand. When I look at them now, many years later, they disturb me in a different way; I am left feeling hollow and haunted. 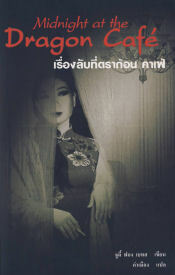 The second book from China, though it looks similar on the outside, holds other secrets. It holds the story of my life, my destiny. Before leaving Hong Kong, my mother took me to a fortune teller to have my I Ching read and my fate revealed. I have no memory of what the fortune teller looked like, only of watching his long slender hands lay out narrow sticks of different lengths. The smell of incense had filled the air. My mother paid a handsome price for the book. Each page was filled with black hand-brushed characters, on the front was a single column of elegant black calligraphy. The characters held such power and mystery, all the more so because I could not read them. When I touch the pages, I can almost sense the heat of the fortune teller’s hand moving down the rice paper with the bamboo-handle brush in his fingers. As a child, I often found myself with the book upside down, turning the pages backwards; I had to remind myself to open it left to right, opposite to the way I opened books at school. Whenever I asked my mother what was written inside, she seemed to hesitate. Her unwillingness made me uneasy. She told me that I would live in more than one country. She told me that until the age of thirteen, water would be my danger sign, that I was never to trust it. I would beg her for greater details about my future, but she would only shake her head and say there was nothing else in the book that mattered.